For Quality Plumbing and Septic Services, Call All About Plumbing & Septic! Are you looking for plumbing and septic services in Mills River, Hendersonville, and Asheville, NC? Look to the professional plumbers at All About Plumbing & Septic! All About Plumbing & Septic is a plumbing company that has been servicing this area since 2011. We are dedicated to offering plumbing and septic services, as well as water heater and water filtration services. If you think that you need repairs for your garbage disposal or you are wanting your septic system pumped, our plumbing contractors are here for you! 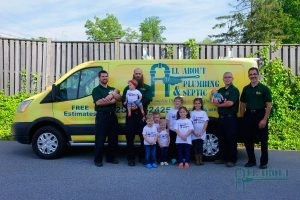 We started this plumbing and septic company in order to help as many people with their septic and plumbing systems. We know that plumbing, septic, and water issues can happen at any time, which is why we offer emergency 24-hour services for commercial and residential clients. No matter if its the weekend or the middle of the night, we are the team to call for all of your emergency and non-emergency plumbing, septic, water heater, and water filtration needs. To get more information, please call us at 828-778-2425 for plumbing and 828-778-2423 for septic and speak with one of our plumbing contractors. While plumbing and septic services are a huge part of what we do, we also offer our clients services for their water heaters and water filtration. If you are looking for high-quality services for your home or business, we are the team to call. We are proud to offer both residential and commercial plumbing to the Mills River, Hendersonville, and Asheville communities. If you need repairs, a replacement, an installation, inspections, or maintenance, you can rely on our plumbers. Below are some of the services that we are able to offer. Call our office today at 828-778-2425 for plumbing and 828-778-2423 for septic to get septic and plumbing services in Mills River, Hendersonville, and Asheville, NC for your home or business! Updated on January 21, 2019 at 11:25 am by All About Plumbing.